Many medical cart manufacturers are designing medical carts that are customizable to any healthcare environment. They recognize that a one-size cart does not fit every office, hospital, or medical facility. Luckily, there are many peripheral options that prospective buyers can choose from to make their staff’s daily job tasks more efficient. With quality patient care at the forefront of many providers’ minds, finding the perfect medical cart accessories is a top priority. Electronic health records systems (EHRs) and the equipment used to access them vary widely from facility to facility, and even state-to-state. For some medical facilities, being able to cart around a small laptop or tablet is enough for providers to access key information and enter patient data. 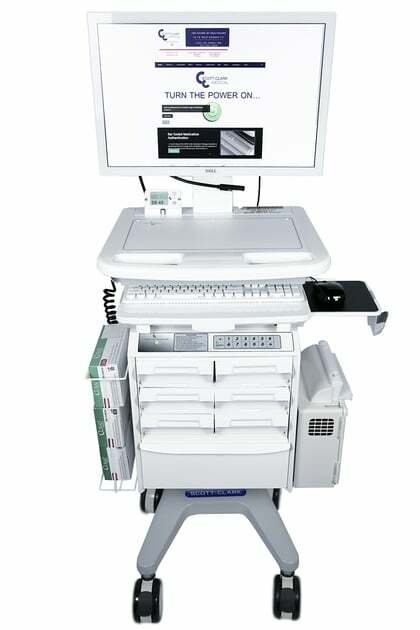 For other facilities, all-in-one computers are the technology of choice for their medical workstations on wheels. Still, others need double monitors to view test results and imaging, including x-rays, MRIs, and ultrasounds. Some doctors are also taking advantage of telehealth options and purchasing carts with camera and sound capabilities. All these options can be worked into the design of your medical cart, and these carts can be custom fitted for your computer and monitor needs. Whether you are utilizing a medication cart, an anesthesia cart, or a supply cart, you want to make sure that your supplies are properly secured. Medical cart manufacturers recognize the importance of securing supplies and medications and have designed solutions including manual and electronic locks. Manual locks are excellent for supply drawers, and healthcare professionals can have peace of mind in knowing that no one can access the drawers without a key. Electronic locking drawers are excellent choices for medications and medical instruments, including sharp tools. Computer access points, from codes to badge swipes, are necessary in order to open the drawers, adding levels of security to very critical items. Many healthcare professionals enjoy the mobility of bringing printers, wristband scanners, and RFID devices with them to each patient. Many of these medical carts on wheels are specially designed to sustain this technology, making patient care more efficient. Also, the development of more powerful battery packs has made mobile medical technology even easier. Most battery packs for medical carts last between 6-10 hours, and sometimes even longer. Hot-swap batteries are an excellent medical cart accessory because they are easy to switch out in less than 30 seconds. Once a cart’s battery indicator light shows that power is low, the healthcare professional can quickly and easily switch the old battery out with a fresh one with minimal disruptions to their work. 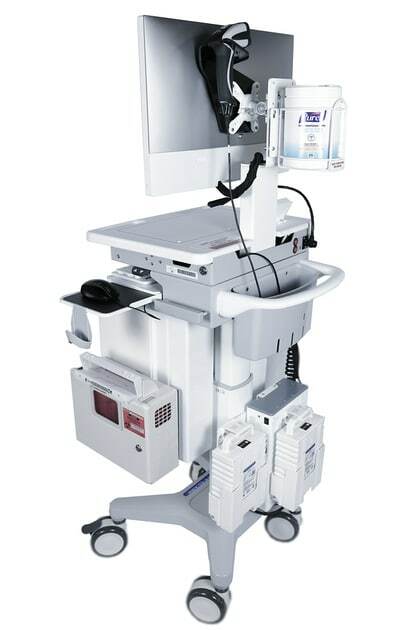 Some medical facilities require their IV and vitals stations to be mobile for their patients, and many medical cart manufacturers have designed carts to meet these needs. The carts are equipped to hold vital signs devices, IVs, and IV supplies. The mobility of these sometimes-cumbersome supplies helps nursing staff efficiently deliver this care to their patients more quickly. As medical facilities, offices, and hospitals vary, so do their storage needs. Medical carts can be equipped with different sizes of drawers and cabinets within the cart. This means that carts can be designed with extra large drawers for busy offices or customized with small drawers for procedure carts. Many carts can also be equipped with disposal options, both for regular trash and sharps disposal. Tabletop extensions are also useful for various tasks, including small in-office procedures or one-on-one education with a patient. The possibilities are endless for customizable options on mobile medical carts. If you’ve been on the fence about purchasing a medical cart for your office or facility, consider the many options that medical cart manufacturers can offer you and your staff. Scott-Clark Medical also provides refurbishing services for old carts to help bring your team and patients the most up-to-date technology. Learn more about the Scott-Clark medical carts by contacting us today.